Artist David Elsea was so inspired by our May picnic ride to Lazare Art Gallery, he painted our luncheon party celebrating friendship by the James River! I was stunned, as I imagine you will be, by the mesmerizing way he captured the happy scene. And he wrote this lovely note to accompany the painting. I'm pulling a thread here. Picking it up from my last missive, woven during the winter solstice, I waxed poetic about the lengthening days when I would be riding with you again. I imagined sunny skies, myself a seedling uncoiling and becoming her summer self, shining with renewal. As our 2018 season began, that thread wound through spring picking up colors and inspiration from engagement parties and birthday rides, family fetes, corporate gatherings and garden tours during Historic Garden Week Virginia. People connecting on a bicycle ride, savoring the day, the coda a bottle of sparkling rose at Upper Shirley Vineyards by the James River. This past spring a bolt of brilliance came from a very special new partnership with Palate Picnics. If I would become who I was meant to be as days stretched ever longer into this new year, then Basket & Bike would also grow and add that element I’d dreamed of from the very beginning, truly beautiful picnic rides. Adding something this attractive could only be realized by the talents of two remarkable women, the women behind Faulkner Norfleet - Inspired Outdoor Gatherings and our delightful Palate Picnics. Beth Norfleet and Mary Yvonne Faulkner create settings so captivating and gorgeous our guests are immediately charmed. Our first picnic ride in May led a group of women on a path of discovery, astride our bikes with baskets. We were celebrating a very special friendship, inspired by the wonderful connector of beauty and friends, Dorothy Nelson, and we made it a day to remember. Beginning at Upper Shirley Vineyards we pedaled out first for a visit to Nordt Family Farm for a visit with owner Dianne Nordt, famous for her hand-sheared, hand-knitted, and hand-dyed blankets and her sweet merino sheep who provide the wool and the love. (Note: I’m saving many images from the farm for a journal devoted solely to that incredibly peaceful place). Then we were off to thread through the countryside to Lazare Gallery, a showcase of Russian Realism paintings located just off the Virginia Capital Trail in Charles City County. This gem of the art world, is impressively situated along a placid stretch of the James River and is the West’s foremost repository of works from the Moscow School of Russian Realism. These masterworks, while influenced by the French Impressionists, have their own unmatched luminous beauty. Owners Kathy and John Wurdeman, have a collection of museum quality pieces that bring buyers worldwide to this peaceful place by our historic river. However, it is not only the paintings but the considerable hospitality issued from everyone at Lazare that is the greatest draw. Kathy, John, and artist David Elsea, who serves as their art restoration expert, have been generous in their welcome to Basket & Bike riders who would like to have a respite along the banks of the river. We hope for moments in life that surprise us with unexpected beauty, where we are curiously charmed and insanely inspired. 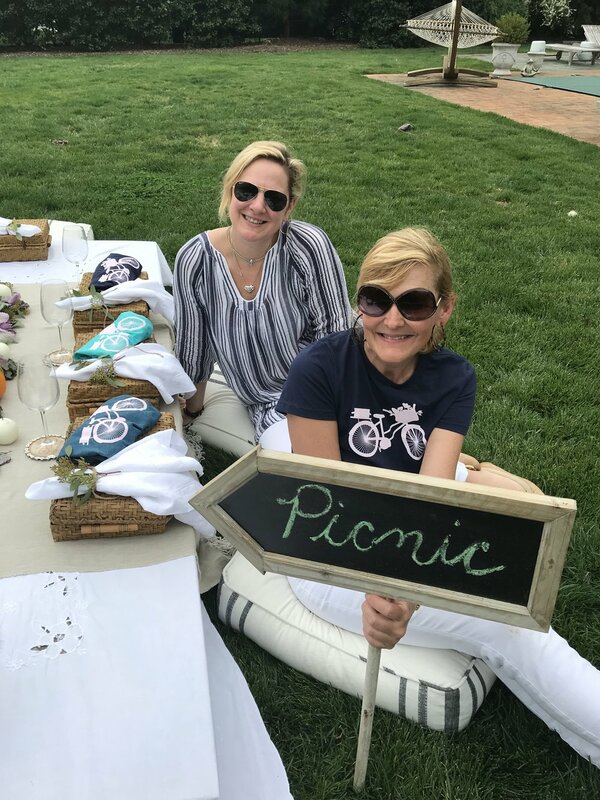 Since this first Picnic Ride along the Virginia Capital Trail from the must-visit Upper Shirley Vineyards (and back for wine at the conclusion of our picnic ride) with a group of very special friends, we have been surprising our riders and giving them a reason to sigh in awe. A collective WOW, fitting considering WOW is an Algonquin word meant to signify a sense of wonder and awe. No doubt a small group of Native American women may have gathered together in such a spot to cherish one another in a time of change. As part of a picnic ride beginning at Upper Shirley Vineyards, our picnic riders spend time biking along a pastoral stretch of historic Virginia’s Route 5, before stopping for the culinary delights of Executive Chef Carlisle Bannister, Upper Shirley Winery Restaurant, which grace the tasty tableaus created by Palate Picnics. Picnic locations are available at Upper Shirley, Lazare Gallery, or another spot along the trail, and are ideal for groups from 6 to 16, but can be modified for larger groups. If you think about that special group of friends, those clients, that celebration, or team gathering, I am certain you will think of a group who would benefit from time outside together, riding a bike, savoring a day away from the hustle over a delightful picnic spread sure to enchant and bring you closer to real moments of connection. Like the plaid picnic blankets from England Beth and Mary Yvonne ordered special for your picnic ride, so many happy colors are weaving us all into fall, inspired by your love for an authentic experience in nature. The seedling me, drenched in an awful lot of rain, a lot of hot sun, with the tawny skin to prove it, and a basketful of summer memories, is ready to fall back to earth, finding golden leaves, and cooler autumn days. As I like to say about Basket & Bike, “Come and experience the beauty of Virginia with us”, a picnic ride is a perfect way to do so. Dorothy Nelson and her new friend! When you come and spend a day with us, you will see that happening upon a Palate Picnic spot after a leisurely bike ride is like stumbling upon a hidden garden, or an impressionist masterpiece, as David’s work so eloquently illustrates. Thank you David, and thank you Dorothy Nelson for being inspired to being a group a friends together for our first Upper Shirley/Capital Trail/Lazare Picnic Ride.